Do you like round beds? They always seem to be an interesting and exciting way to spice up the bedroom. 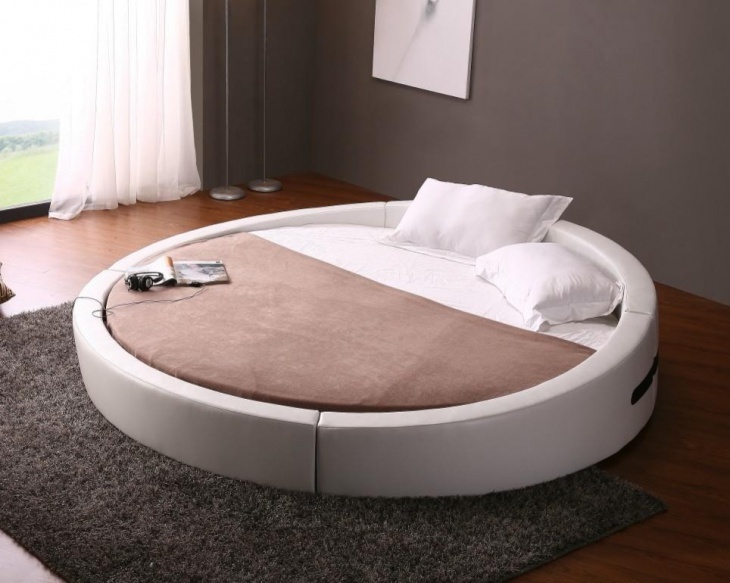 However, only few people actually go for round beds due to their unique disadvantages. It requires a change of perception and innovation in design to take the essence forward. The idea of round beds isn’t too new or earth shattering in itself. 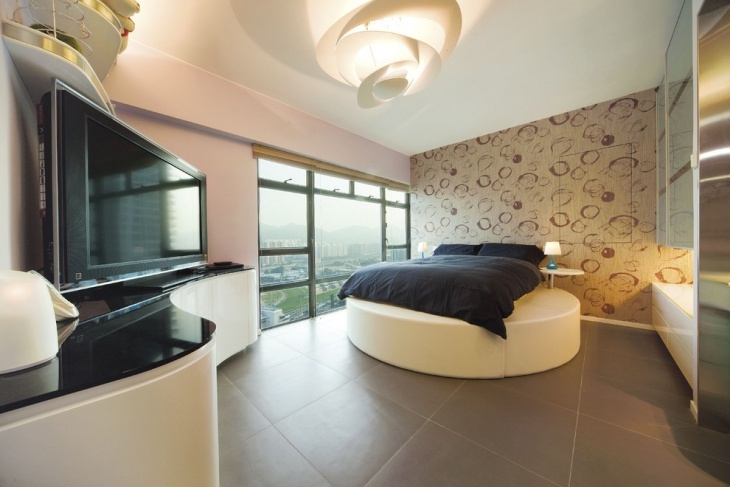 Here we look at some of the unique ways in which round beds can glorify your bedrooms. If you have a couple of kids and a kid’s room that has enough floor space, a round white bed would be a unique and exciting idea. The experience of sleeping around in a round bed isn’t special and putting it in the kids room makes it more convenient! In this example the round bed stands as a frame for the usual sized rectangular bedding. Howsoever, the look created is unique and something that everyone would like to try. The edges do give some extra space to keep things around if you are lazy to get up! A round bed is automatically trendy but you can further spice it up by using colorful cushions. A floral printed bed sheet with a bunch of different colored cushions as in the example will perfectly suit young couples, kids and young girls! This is the round bed design idea that any young couple would look forward to. Highly plush and comfy, this round bed also has bed curtains and a chandelier integrated into the unique bed space. This is invariably a mood of romance, coziness and privacy. Look forward to having a glass of champagne with your partner and lose yourself to the night! 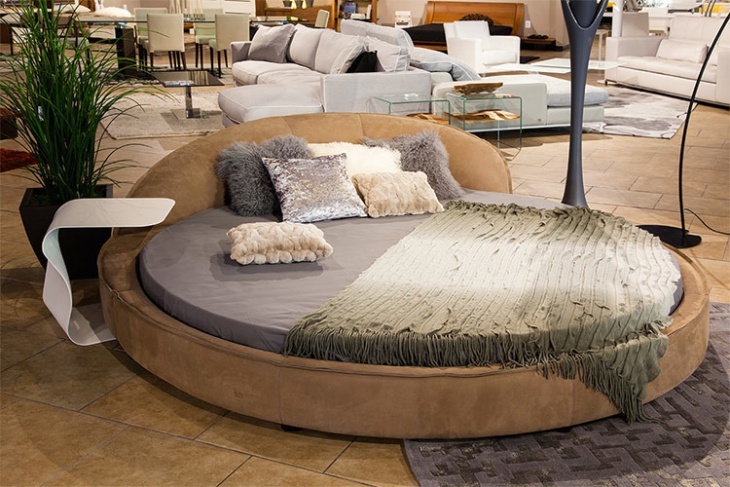 A round bed in brown leather looks highly exotic. Add to it red cushions, bed covers, and a romantic backdrop and we are looking at the perfect setting for a couple. 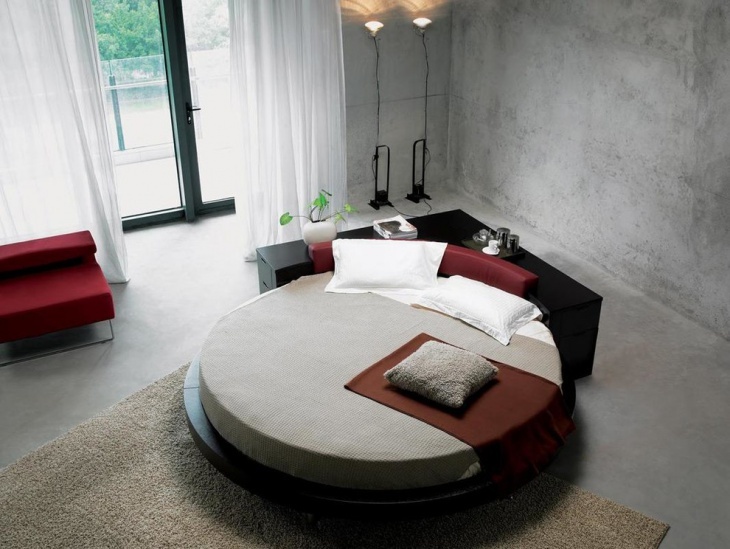 Perfect for any modern couple out there, this is a simple yet gorgeous idea for a round bed. 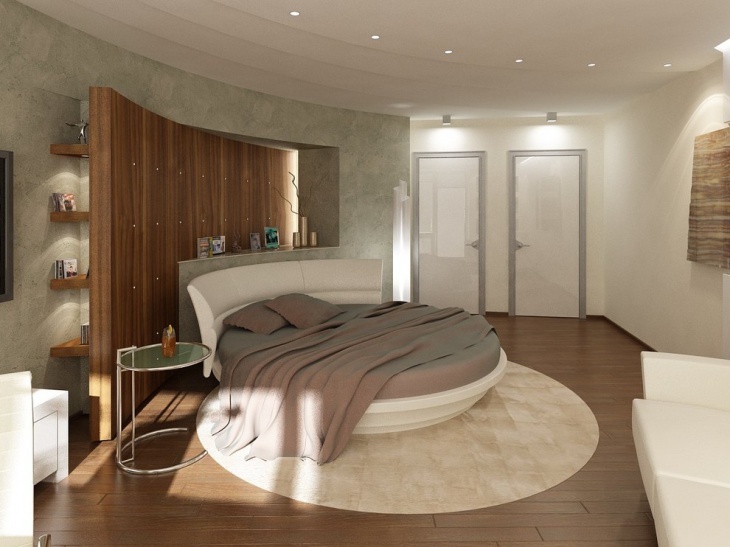 An overall white theme for your bedroom with a round bed is simplistic yet gorgeous. It doesn’t need too much of accompanying furnishing to complete the look of such bedrooms. Just the use of effective lighting and a couple of tables and cabinets will round off the look. There little more you require when you have a round comfortable bed and a console beside! 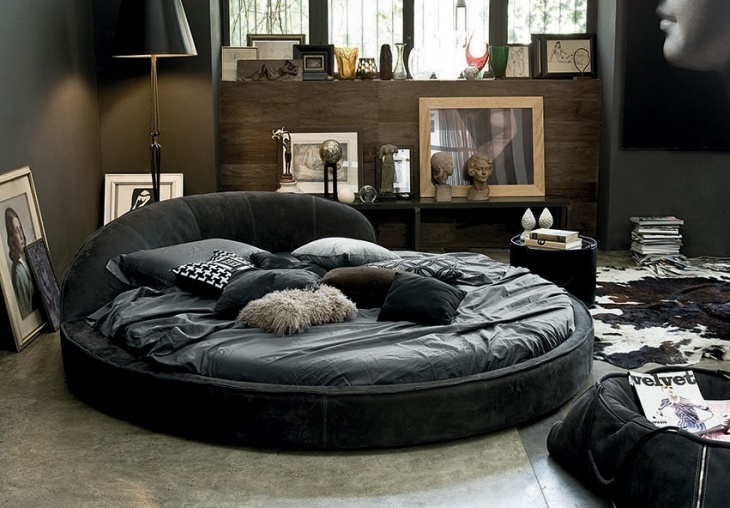 Thoroughly organized, this round bed forms the center place of the bedroom. With enough amount of lighting, you are looking at a very charming ambience to get lost in! If you have the advantage of an amazing view from the window, there’s little more required to complete your bedroom apart from a cozy round bed. It might be the only piece of furnishing in the whole room but that’s all you require. Add a bedside stand for convenience and you won’t have to worry about getting up and put your champagne glassed in the kitchen! There are no colors better suited to a bedroom than a combination of red and white. This round bed gets similar linen and looks exotic and romantic. Perfect for couple, regardless of their age, this will be a bed that will be the focal point of the whole property! Now, this is a bedroom where you will always die to come back to at the end of the day, especially if someone is already waiting for your company! 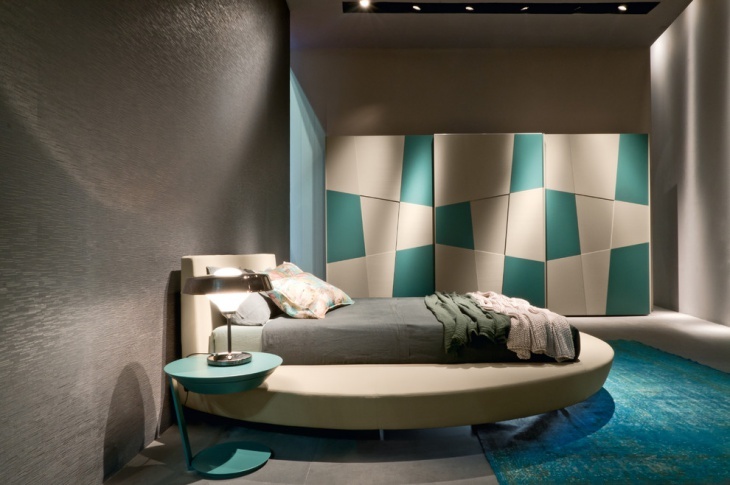 Contrasted by irregular patches of color, this is an ambience that all bedrooms are supposed to have. Loved our round bedroom compilation? If you have something unique to share in these lines, we would love to hear it.